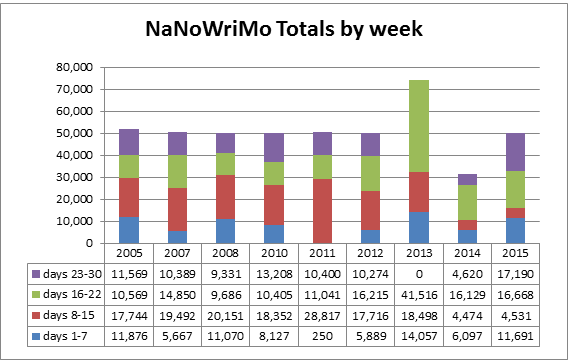 Since 2005, I’ve done NaNoWriMo (AKA National Novel Writing Month) nine times, skipping years 2006 and 2009. Of those 9 attempts, I’ve won 8 times, and lost once (writing just over 31000 words in 2014). Because I love math (I have a degree in mathematics) I needed to summarize my participation with a whole pile of statistics. 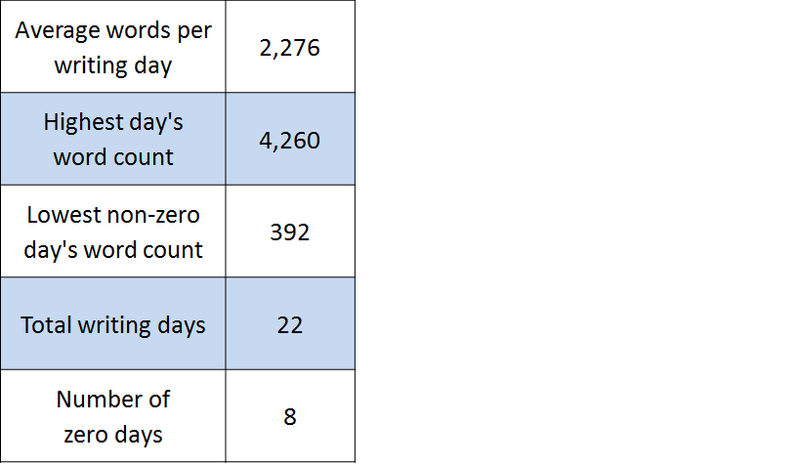 First, a chart that summarizes the total number of words I wrote during each participating November. 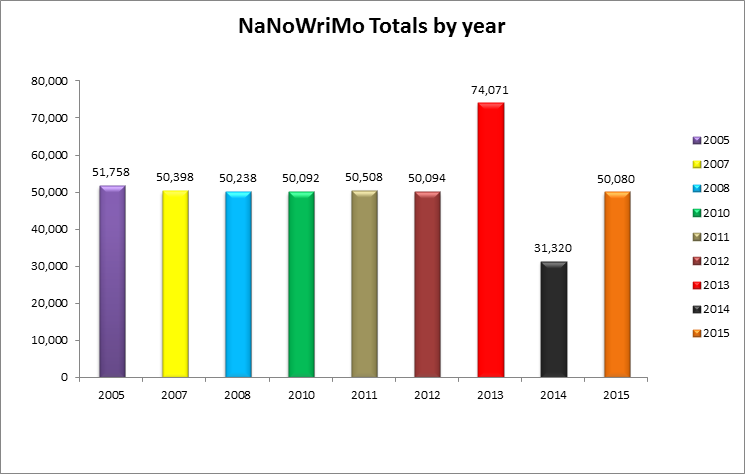 Notice that in 2013 I wrote WAY MORE than 50,000 words. That was the year I rented a cottage for a week for a solo writing retreat, during which I wrote 40,482 words in 6 days. Next, I give you two charts for 2015! 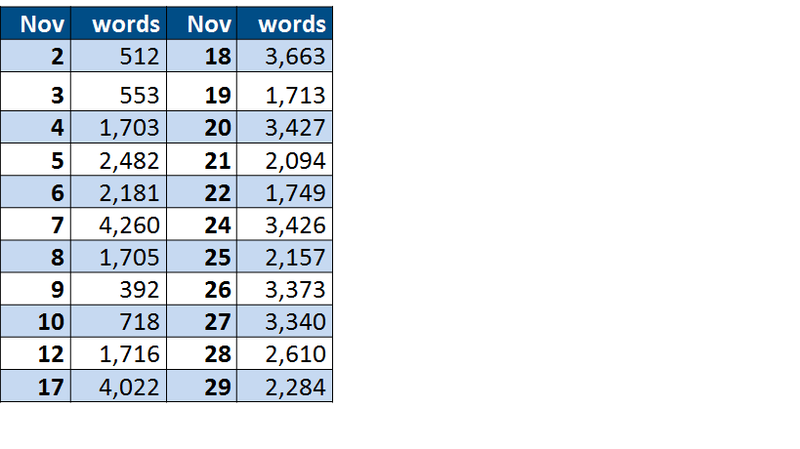 First, my daily word counts for 2015 (note I excluded the days I didn’t write any words at all). As you can see, this year I had a great start and then fell apart in the second week, forcing me to work extra hard in the second half of November to catch up and win. I’ve undergone some drastic personal renovations of late. Like the mythic phoenix, (remember Fawkes in the Harry Potter books) I have burst into flames, reduced to a pile of ashes. Unlike Fawkes’ miraculous rebirth, mine has been much slower. And on so many different, interconnected fronts. On the last weekend of September, 2014, I tore the meniscus (in two places) in my right knee. After thousands of dollars of physiotherapy, an MRI, a family doctor who referred me to a sports medicine doctor, who referred me to a surgeon, I had orthoscopic surgery to repair the tears. More physiotherapy and I was ALMOST “better”. The better was an illusion though, and soon I found myself relying on the cane again. I’ve come to the emotional conclusion that I will never be “better” in the true sense of the word. The cane will be a permanent accessory. My blue parking pass might need to be renewed when the expiry date approaches. My days of being completely and utterly self-sufficient are over. Lack of self-sufficiency is probably the most difficult piece with respect to my physical changes. I like doing things myself. I like being capable of mowing my own lawn, shoveling my own driveway, and cleaning my own house. Sure I don’t exactly ENJOY doing these tasks, but NOT being able to do them is way, way worse. Not being “able” means pestering my kids to help. Or, alternatively, paying strangers to do the work. These financial and emotional costs are difficult to bear. I also had a milestone birthday this year. My age once again ends in a zero. And I have to say that meeting this particular birthday with a cane in my hand is a nasty harbinger for my future. I’m not sure if, or when, I will ever completely come to terms with this new, older, “broken” me. Ultimately, I want to re-introduce exercise into my life. Every day I don’t use my exercise bike and turn my back on my physiotherapy exercises, I know I’m doing myself a disservice and my mood will be all the grumpier because of it. But after a year of physio, I need to step away from it, at least until the thought of doing these exercises feels less ugly. My relationship metamorphosis involved breaking off my seven+ year relationship. While any disentanglement takes time, I am working through it. My need for order took over at a fundamental level this past September. As an easy way to reclaim order, I focused on my immediate surroundings. Specifically my house. The order began with a purge of one cupboard after a trip to the grocery store. I re-organized the soup, pulling the cans from the back and discovering a few had gone well past their expiry dates. One shelf turned to several, until I’d completely purged my kitchen. Next, I moved my focus to my closets. The front hall closet, which hasn’t closed properly in ages, has been tamed and organized. My walk-in closet is also much tidier. I have yet to tackle the guest room closet, but that work requires plaster and paint, and the re-installation of closet shelving. I can’t tackle a renovation right now. In tandem, I’ve been working on the greater, structural aspects of my home. After months of waiting, I had my roof re-done. Three days of mess and noise, plus one hefty payment, and that task is done. The roofer recommended an eaves repair company, and after some minor repairs, they installed leaf guards. So I won’t be scrambling every fall to find someone to de-ickify my eaves. After enduring the fiasco that is “getting a bunch of quotes”, I signed a snow-removal contract and enlisted the aid of a new housecleaning service, solving the issue of keeping my house clean and my driveway clear with a bum knee. As a bonus, these quotes produced leads on landscapers to deal with the gardening I didn’t/can’t get to. (My knee surgery just happened to coincide with the beginning of the 2015 gardening season.) I also tidied my shed and garage to make room for my vehicles for the impending winter. Because…you know I have to say it…winter is coming! On the financial front, I’ve recently endured a minor audit by the Canada Revenue Agency. They always seem to sense the absolute worst time to mail their letters to the unsuspecting. I visited with a lawyer to update my will and powers of attorney. My children are at very different stages now than when I wrote up my last papers. Of course, the visit only opened my eyes to more details that need to be investigated and/or considered before the drafts can be drawn up. That means more phone calls, more meetings, blah, blah, blah. As much as these sorts of matters make most of us feel uneasy, taking tiny steps feels good. Don’t wait. I’ve lost too many friends and relatives recently. I’m not a devout person. I probably lean closer to an agnostic than an atheist, but I’m still, technically, a Christian. I’m not going to suddenly join a church, (a bit ironic, considering my last name) but I do feel as though I need something more. A deeper understanding of myself. I’m certain my recent ends-in-a-zero birthday has contributed to my yearning for more. As does my change in physical ability. Meditation helps, so I’ve been doing more of it. But introspection tends to be only half the recipe. I need to interact with others. And while the convention circuit, combined with my authorly appearances, helps somewhat, my knee limits the size and number of these activities. I need another outlet for socialization. Like a club, or volunteering. Cue the research, phone calls, list-making etc. I am slowly growing my phoenix feathers out of the ash. One day, one hour, one phone call, one appointment at a time. I don’t much like being a metaphorical pile of ash, but it certainly beats the alternative. Over on 49th Shelf, Kiley Turner posted the list below. I’m so thrilled that my collection of short fiction is included with so many fabulous books, written by so many talented friends and colleagues. 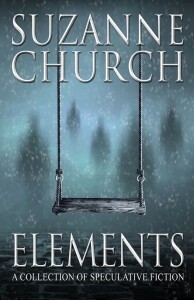 What’s even more exciting is that “Elements” is FIRST on the list. 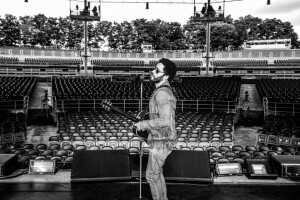 So proud and humbled right now. For the first time in almost a decade, I didn’t attend DragonCon this year. Mostly because I couldn’t book a room at the Hyatt. Partly because of my knee injury/surgery/recovery. 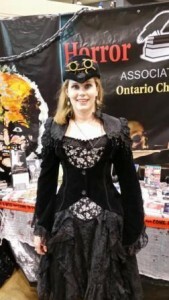 Instead I attended Fan Expo in Toronto. This was the first time I embraced FanExpo in its entirety, renting a hotel, working at the HWA booth, speaking on multiple panels, the whole nine yards. In the past, the most I’ve done is drop by for a day to do a little shopping. And shopping happened, believe me. Check out my new jacket and skirt shown at right. Many people behind the scenes with my local (Ontario) HWA Chapter pulled out all the stops to make the experience memorable. Special shout-outs, firstly to Lou Rera who booked the booth for us, decorated it, and organized the schedule, all from another country (yep, Lou lives across the border in the USA). Secondly to our dedicated chapter leader Séphera Girón who pitched three excellent panel topics for us to show our talents: So You Want to Write Horror?, What Scares You?, and The Next Big Thing in Horror. The panels were well moderated by Richard S. Todd and well attended. I enjoyed spending those 50 minutes with my fellow panelists: Stephanie Bedwell-Grime, Brian F.H. Clement, Séphera Girón, Nancy Kilpatrick, Brad Middleton, Lou Rera, Bill “Zombie Zak” Snider, and Julianne Snow. (Fingers crossed that I remembered every panelist!). We shared our thoughts, experiences, and horror knowledge. Séphera also planned our Saturday evening get-together, giving us all a chance to talk shop. My many shifts at the booth gave me a chance to meet readers and writers, talk about all things horror (and speculative fiction in general), and promote not only HWA, but also my 52 writing tips and NaNoWriMo to name only a few writing resources. One of the best highlights came on Sunday when I met horror ICON George A. Romero. Overall, FanExpo lived up to its expectations as Canada’s coolest, geekiest, shopping experience. Even though I enjoyed getting to know my fellow HWA chapter members, who I now consider my pals, I missed my DragonCon peeps, especially my fellow reporters for The Daily Dragon. Next year, my convention dollars will probably go towards GenCon. I had to cancel my appearance at 2015 GenCon due to knee surgery recovery. I’ll probably miss DragonCon again in 2016, and that thought makes me melancholy. But new experiences help fill the writing well.